Happy Wednesday! I get half a day off of work today so I'm excited and just trying to ride out the next few hours. Then I'm going Thanksgiving shopping with the boyfriend so we can cook our first Thanksgiving dinner together. Wish me luck! A few months ago I was lucky enough to be involved with the launch of a new company, Say On Me. 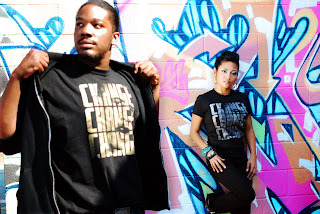 They have officially launched with a line of socially and politically conscious t-shirts all promoting change for the better. 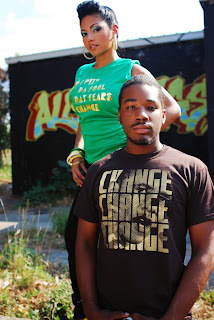 I did the makeup for the shooting of their shirts. There were two models, one male and one female. For the female model, Stephanee, I did a neutral look for the studio shots, and then I did a brighter teal eye for the outdoor/graffiti shots. For the male model, Jay, we focused on trimming his facial hair and cleaning up his skin, whew that was some work, lol. In the end, it came out really well. Make sure to check them out on http://www.sayonme.com/. 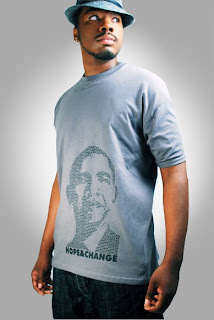 They also have a bunch of Barack shirts on there that are hot! On Stephanee I used a bunch of starflash shadows. This is similar to the look I used for my everyday look video, including: grand entrance, bold and brazen, and glamour check eyeshadows. Here I used the Heathrette trio with the aqua colors. We wanted something a bit more bold and bright to go with the graffiti settings in the back. Some group shots outdoors. We found a really cool building in Atlanta which was painted on both sides with awesome graffiti. Nice work as usual, lol... I love that emerald color, it seems to be my favorite. 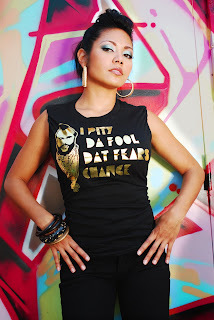 I love the tee statement!!! Very empowering!!! I love the look wherein you used the Heatherette trio..I love love love it! great work!! You always do such a great job with your models. enjoy your half day..I get one too. YAYAYAYA. that heatherette look is hotness! so beautiful! Beeeautiful work! Awww, have fun cooking your Thanksgiving dinner with the boyfriend! The first time I tried to cook turkey with my boyfriend, his mom had to come and rescue us b/c the turkey was raw on the inside lolol! Have a great weekend! She looks gorgeous in teal Ren :) Have a great Thanksgiving with your boy. Maybe you can snap some photos of your dinner for us to see later. whats up ren?! its joy...love what u did with the graffiti background! hot stuff!! thanks for the post. im goin to check out the webpage!